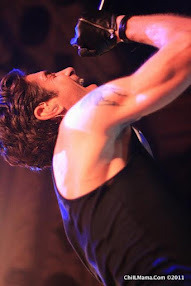 ChiIL Live Shows: ACT OUT HOLIDAY: BURNING BLUEBEARD, returning November 21, 2013 – January 5, 2014 at Theater Wit. ACT OUT HOLIDAY: BURNING BLUEBEARD, returning November 21, 2013 – January 5, 2014 at Theater Wit. There are a few of our all time favs returning for the 2013 holiday season. Burning Bluebeard tops our must see list along with Hellcab and A Christmas Carol at The Goodman. Highly recommended! ChiIL Live Shows ChiIL Picks List for best holiday theatre. BurningBluebeard-1 (left to right) Anthony Courser , Jay Torrence, Dean Evans, Leah Urzendowski Courser, Ryan Walters and Molly Plunk in BURNING BLUEBEARD by Jay Torrence, directed by Halena Kays. Photo by Evan Hanover. Burning Bluebeard won't break the bank and is an amazing dark comedy, with thought provoking dialogue and amusing physical play. We thoroughly enjoyed it last year, and my 12 year old is clamoring to see it again, though my 10 year old daughter said it was a bit too scary for her after seeing it last year. I took them both, because Anthony (Bluebeard) had been their circus instructor for a while and they love to see their instructors in creative projects. But there's one intense scene (blackout/audio only recap of the fire) sensitive kids may have a tough time with. We'd give it a PG13/mature tweens and up rating, because of the macabre subject matter (children trampled, burned & dying in a theatre fire! ), though handled tastefully. Burning Bluebeard is based on a true slice of history that should be seen and remembered, especially if you frequently see shows at The Oriental Theatre. 110 years after this tragedy, Burning Bluebeard depicts this horrific event many are completely unaware even happened, in a poignant and creative way. It's a moving tribute. BurningBluebeard-2 (left to right) Dean Evans, Jay Torrence, Leah Urzendowski Courser, Ryan Walters and Anthony Courser in BURNING BLUEBEARD by Jay Torrence, directed by Halena Kays. Photo by Evan Hanover. 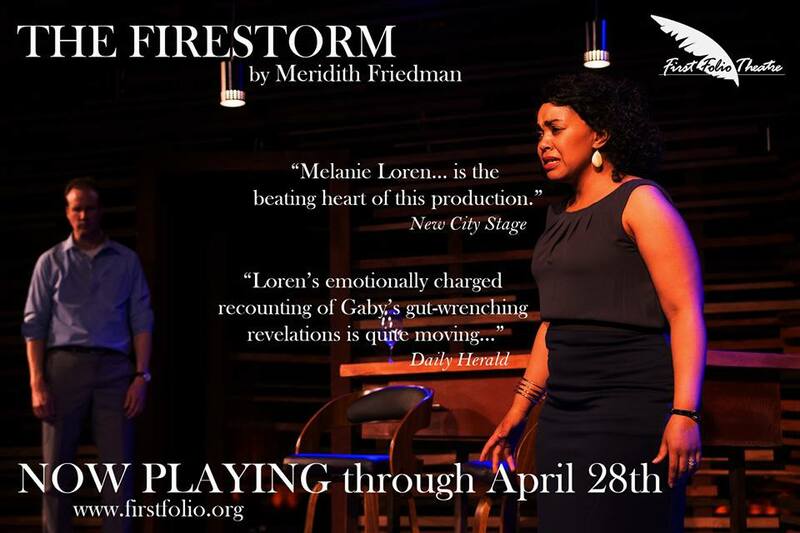 With Chi-town favs Jay Torrence, as writer, and Halena Kays directing, this is an absolute must see. The original cast is back again as well, and a true joy to watch in action. Anthony Courser , Jay Torrence, Dean Evans, Leah Urzendowski Courser, Ryan Walters and Molly Plunk do a stellar job with grim subject matter. They'll have to rewrite the fire escape rap (one of our fav parts of the last show-though specific to the TMLMTBGB space they were in last year). Please please put last year's on YouTube for me or let us run it here on the blogs for posterity! Otherwise, we imagine the remount will be quite similar and every bit as effective this time around at Theater Wit. 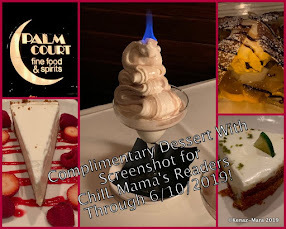 Click here for our past coverage. For an avant-garde alternative to the holidays, The Ruffians are pleased to announce the return of the hit historical romp BURNING BLUEBEARD by Jay Torrence, directed by Halena Kays and featuring the full original cast and creative team. 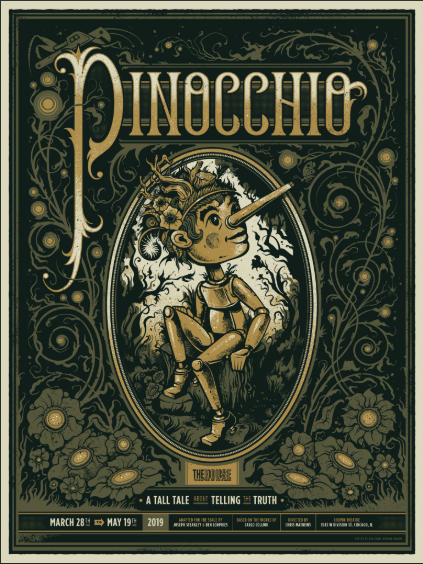 This fantastical tale inspired by Chicago’s 1903 Iroquois Theatre fire will play November 21, 2013 – January 5, 2014 at Theater Wit, 1229 W. Belmont Ave. in Chicago. Tickets for BURNING BLUEBEARD are currently on sale at www.theaterwit.org, in person at the Theater Wit Box Office or by calling (773) 975-8150 ($18 advance tickets will be available a limited time only). Originally mounted at The Neo-Futurarium in 2011, the remount coincides with the 110th anniversary of the Iroquois Theatre fire. On Monday, December 30, the actual anniversary of the legendary fire, The Ruffians will present special performances at 3 pm matinee (the actual time of the fire) and 7:30 pm. BURNING BLUEBEARD will feature the full original cast including Anthony Courser, Dean Evans, Molly Plunk, Jay Torrence, Leah Urzendowski Courser and Ryan Walters. Inspired by the true story of Chicago’s 1903 Iroquois Theatre Fire, BURNING BLUEBEARD is the story of six singed clown performers who emerge from the burnt remains of history attempting to perform their spectacular Christmas Pantomime once and for all. But this time they hope to finally reach the true happy ending of their second act and avoid the fateful fire that killed 600 of its audience members. 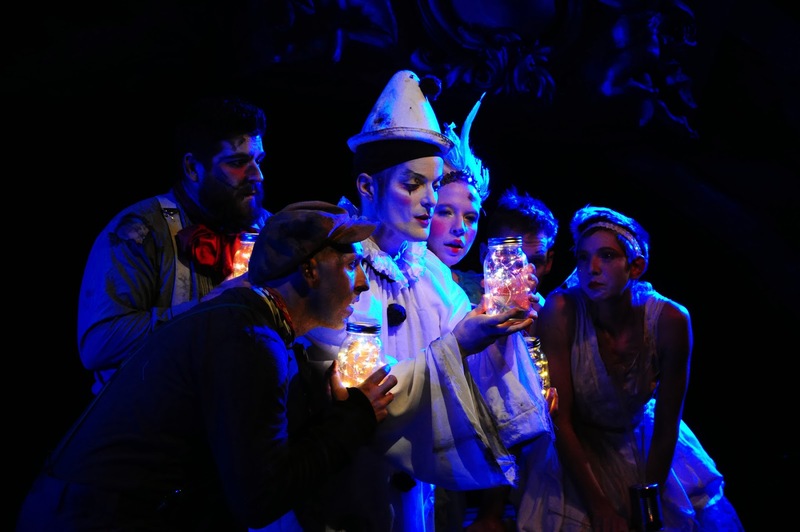 BURNING BLUEBEARD is a whimsical romp with a sensitive heart, a joyful eulogy with a sharp irreverent wit including slapstick, vignettes, tumbling and dance. Each night is a vaudevillian delight with a story that excavates the poetic and poignant remains of a piece of Chicago’s rich history. 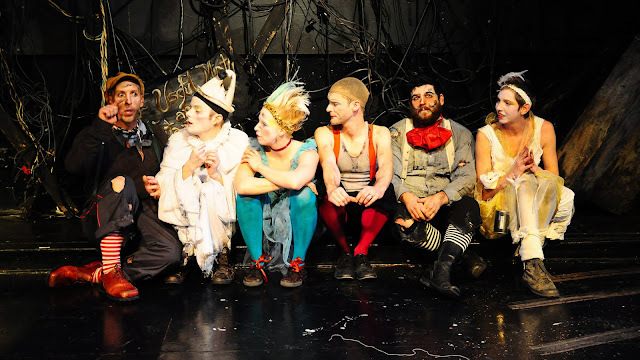 During its original run BURNING BLUEBEARD received critical praise and was named one of the “2011 Best of Fringe” by the Chicago Tribune, one of the “Top Five Funniest Shows of 2011” by WBEZ Radio and one of the “Twelve Outstanding Ensembles of 2011” by Time Out Chicago’s Kris Vire. 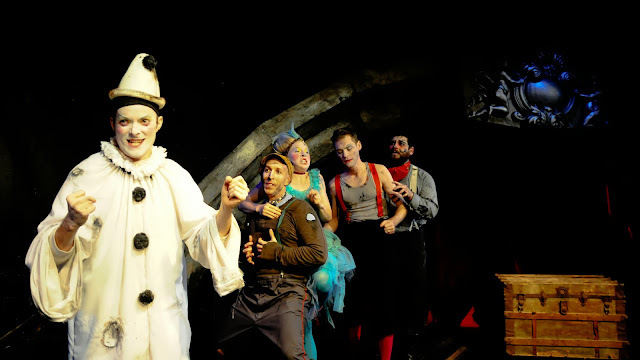 Featuring: Anthony Courser (Henry Gilfoil), Dean Evans (Fancy Clown), Molly Plunk (Faerie Queen), Jay Torrence (Robert Murray), Leah Urzendowski Courser (Nellie Reed) and Ryan Walters (Eddie Foy). Curtain Times: Thursdays at 7:30 pm; Friday at 7:30 pm; Saturdays at 3 pm & 7:30 pm; Sundays at 3 pm. Iroquois Fire 110th Anniversary Performances: Monday, December 30 at 3 pm (the time of the actual fire) and 7:30 pm. Tickets: $18 - $36 ($18 advance tickets will be available a limited time only). Student rush tickets available for every performance (subject to availability). Tickets for BURNING BLEARBEARD are now on sale at www.theaterwit.org, in person at the Theater Wit Box Office or by calling (773) 975-8150. Jay Torrence has been writing/performing/directing in Chicago since 2002. His playwriting credits include Ivywild, Burning Bluebeard and Roustabout: The Great Circus Train Wreck (Awarded the John W. Schmid After Dark Award for Outstanding New Work and the After Dark Award for Outstanding Production). Torrence has had the privilege to perform with 500 Clown, The Hypocrites, Redmoon, The Actor's Gymnasium, Chi-Town Clown Review and The Neo-Futurists where he was an ensemble member for twelve years and the former Artistic Director. Torrence earned his MFA in Creative Writing from The University of British Columbia and has studied under master clown Philippe Gaulier. He is a published essayist and the proud recipient of the Prairie Fire Award for Creative Non Fiction and The Annie Dillard Award for Creative Non Fiction. Halena Kays is the artistic director of The Hypocrites where she both performs and directs – most recently The Fall of the House of Usher (actor), Ivywild and Six Character in Search of an Author (director). She is the co-founder and former artistic director of Barrel of Monkeys where she created and directed the majority of their public performances, including their critically acclaimed long-running show: That’s Weird, Grandma, called “the best reason to live in Chicago on a Monday night” by Time Out Chicago. Kays is also an Artistic Associate with the Neo-Futurists were she directed 44 Plays for 44 Presidents, Burning Bluebeard, co-created and directed Daredevils and Daredevils Hamlet and the sight specific extravaganza, Fake Lake. She has worked with many other Chicago theatre companies over the years including: The Kid Thing (About Face/Chicago Dramatists), Oedipus, Mud and 4.48 Psychosis (The Hypocrites), The Children’s Hour (Timeline), The Golden Truffle (Redmoon) and Fair Use and Theatrical Essays (Steppenwolf). Kays has been nominated for a Jefferson Citation for Best Supporting Actress and Best Direction, named one of the top 50 “players” in Chicago theater by Newcity. She is a UT-Austin and Northwestern grad, former member of the Big Apple Circus Clown Care unit and the Co-artistic Curator for Theater on the Lake. BurningBluebeard-3 (left to right) Jay Torrence, Dean Evans, Leah Urzendowski Courser, Ryan Walters, Anthony Courser and Molly Plunk in BURNING BLUEBEARD by Jay Torrence, directed by Halena Kays. Photo by Evan Hanover.